Arrow 7.4: “Level Two” Review – Eggplante! 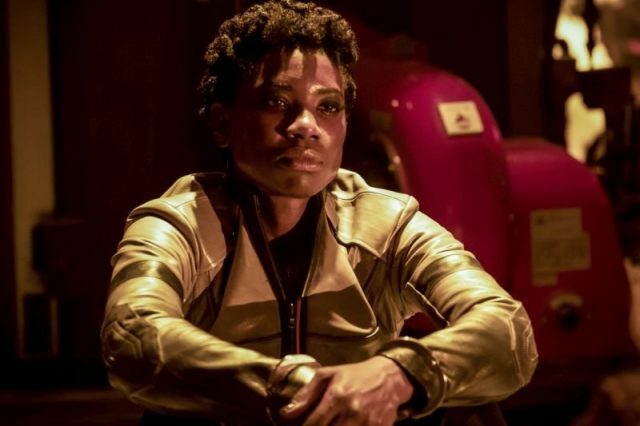 Arrow has enjoyed a big improvement in quality since its seventh season has started, but beyond the lingering presence of Diaz and the debut of his special hit squad, the Longbow Hunters, the exact newest threat facing Star City hasn’t yet made itself clear. This somewhat changed this week, particularly regarding the flash-forwards, which were entirely absent in last week’s standout episode, only to make a return and prove that the real mystery facing the adult William isn’t actually on Lian Yu. Instead, it appears that William will somehow be instrumental in fighting a threat within the future Star City, apparently created by an all-new, super-powerful rendition of The Glades that has since led to the fall of the rest of the city. Even with so much forward movement in the flash-forwards this week however, “Level Two” still also had to carry a series of crucial storylines in the present, particularly with Oliver, who has now successfully gotten himself kicked down to Level Two of Slabside Penitentiary. 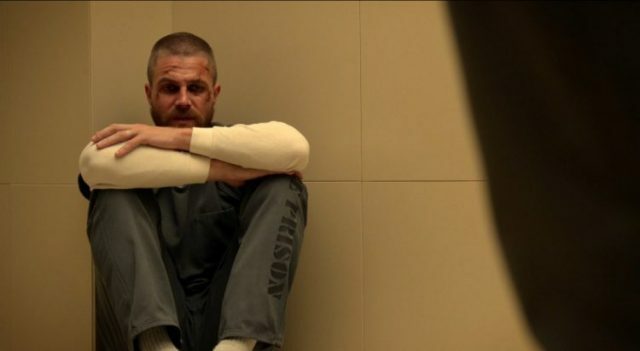 It doesn’t appear that Oliver’s mission to find The Demon is getting any easier however, since he winds up essentially confined and tortured in a solitary cell that is constantly overwhelmed by flashing and noise, with the only interruptions occurring when a prison psychiatrist pays him a visit to talk about his past. Yes, we’re revisiting Oliver’s past for the umpteenth time, something that Arrow purported to definitively wrap up after Prometheus’ defeat in Season Five, which may annoy some viewers for sure! At least this time we got a bit of a switch however, since the past exploration ends up connecting to William, rather than just probing the festering darkness that lurks within Oliver’s own soul. This also ties in nicely with the increased emphasis on the flash-forwards this week, as Oliver is forced to recount how he lost his father, and how he may have done things differently if he were in Robert’s shoes during that fateful day when the Queen’s Gambit was sunk. The psychiatrist is definitely suspicious, but Oliver doesn’t have much time to think on this, since he’s constantly tortured and pumped full of drugs, which essentially forces him to confess his own desires for William’s future, before eventually being so mentally broken that he has no choice but to fully retreat into his Slabside identity as Inmate 4587. I wouldn’t be surprised if this psychiatrist actually ends up being The Demon all along, which would also explain why Brick claimed that no one can find The Demon, and The Demon can only find you within the prison. Whatever the case ends up being though, Oliver is rapidly losing his will to keep pursuing Diaz, and that’s a big problem! Oliver’s main prison arc at Slabside is continuing to be one of the strongest storylines on Arrow at this point, but we also got some pretty decent plots from the other characters too. 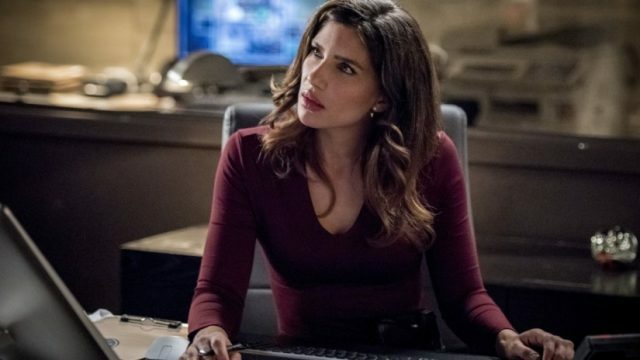 Rene ends up separating from Felicity to pursue his own storyline this week, but Felicity is nonetheless continuing to try and squeeze intel about Diaz from the Silencer. When she gets nowhere, Felicity subsequently enlists Laurel to try and torture the info out of Silencer, and to the show’s credit, this doesn’t quite go where you imagine it will. Laurel instead makes a plea to Felicity to not go down a road of torture and murder, something that Rene echoes beforehand, since Laurel ended up losing herself to grief during her former life on Earth-2, and that’s what led to her becoming a criminal. The two women do end up putting their heads together to plant a tracker on Silencer and intentionally allow her to get away, which is certainly risky to say the least, but Laurel truly is the ideal confidant for Felicity at this point. Seeing Laurel suddenly be the moral compass is a nice switch, and one that actually makes a lot of sense in this context, without fully eliminating her character’s rough exterior. Rene, meanwhile, ends up unwittingly being at the center of an arson attack on the community center in The Glades, which Zoe also ends up being injured in. The new Green Arrow ends up saving Zoe’s life however, leading to Rene doubling down on advocating for the mysterious new vigilante, much to Dinah’s chagrin. The show is continuing to explore Dinah being overwhelmed at the SCPD and constantly trying to reconcile her former vigilante identity with her new police responsibilities, but it didn’t work quite as effectively this week. Dinah actually arresting Rene after he helps the new Green Arrow get away feels rather excessive, and the storyline of Dinah supposedly learning how to work with vigilantes like the late Quentin Lance did rings a bit hollow, since Dinah really shouldn’t need to learn this lesson. If Dinah’s as frustrated as anyone with the shackling of vigilantes in Star City, then what does she care if Rene takes responsibility for letting the new Green Arrow run free? There’s no real proof that she’s complicit with Rene here. Not helping matters is that the arsonist villains-of-the-week are disappointingly dull, not to mention quite easily taken out once they’re cornered, but at least Dinah finally decides to drop the resistance to the new Green Arrow being in Star City by the end of this pursuit. She was obviously going to lose that argument, so long as the show doesn’t want to turn her into a full-blown antagonist. Like I said though, it’s the flash-forwards that will probably leave the biggest impact on viewers this week. I’m actually glad that the show didn’t force them into last week’s episode, since this allowed the flash-forwards to be executed in an extra satisfying and unexpected fashion this week, working more logically with the present-era storylines. Once Roy and William arrive in the fallen Star City of the future, the coordinates that Felicity gave to William change, and this leads the two men to the ruined Smoak Technologies building, suggesting that some of the future 2046-era Star City that was seen on Legends of Tomorrow has remained intact, even post-Flashpoint. Apparently though, a powerful and dangerous new rendition of The Glades has led to cops lethally hunting down vigilantes, of which Dinah is operating as once again. Not only that, but an adult Zoe also appears to be Dinah’s vigilante protegee in the future, despite Rene having supposedly abandoned Star City long ago. Apparently, Felicity wants William to be part of this battle to bring down The Glades, since her clues eventually lead to William finding a map into The Glades’ vulnerable weak spots. It initially seems like a path to Felicity as well, but the episode ends on Dinah telling William that Felicity is apparently dead in the future, and couldn’t have sent the clues. I’m sure that there’s more to this claim than meets the eye, but if Felicity really is dead in the future, this might cast a nice shadow over her character in the present, especially given her new dark turn that’s being somewhat overseen by Laurel. “Level Two” didn’t end up being quite as outstanding an Arrow episode as last week’s, but I suppose that’s understandable to a point, considering that last week’s episode is a very tough act to follow. Still, the show is laying the groundwork for plenty of promising new developments here, setting up a scary new take on The Glades, even if it’s primarily explored in the future, while also threatening to undo the very principles on which Oliver built his vigilante identity as The Hood, The Arrow, and eventually the Green Arrow. The idea of Laurel becoming party to the result of Felicity’s growing grief and rage is an especially inspired turn, one that could help redeem Laurel just as easily as it could end up condemning Felicity. There’s certainly a lot happening on Arrow right now, but the season nonetheless shows no signs of tripping up at this point. I’m still cautious with my optimism for now, but I haven’t been this hooked on the show since Prometheus was at large, and that’s definitely a great thing! Arrow is continuing to nicely lay the groundwork for new threats this week, finally bringing the true plight of Star City's future into focus.